This webpage provides a spacetime texture database. The database contains a total of 610 spacetime texture samples. The videos were obtained from various sources, including a Canon HF10 camcorder and the BBC Motion Gallery; the videos vary widely in their resolution, temporal extents and capture frame rates. Owing to the diversity within and across the video sources, the videos generally contain significant differences in scene appearance, scale, illumination conditions and camera viewpoint. Also, for the stochastic patterns, variations in the underlying physical processes ensure large intra-class variations. The figure below illustrates the overall organization of the York University Vision Lab (YUVL) spacetime texture database. The data set is partitioned in two ways: (i) basiclevel and (ii) subordinate-level, by analogy to terminology for capturing the hierarchical nature of human categorical perception . The basic-level partition, is based on the number of spacetime orientations present in a given pattern; for a detailed description of these categories, see Section 2.1 of . For the multi-dominant category, samples were limited to two superimposed structures (e.g., rain over a stationary background). Note, the basic-level partition is not arbitrary, it follows from the systematic enumeration of dynamic patterns based on their spacetime oriented structure presented in Sec. 2.1 of . 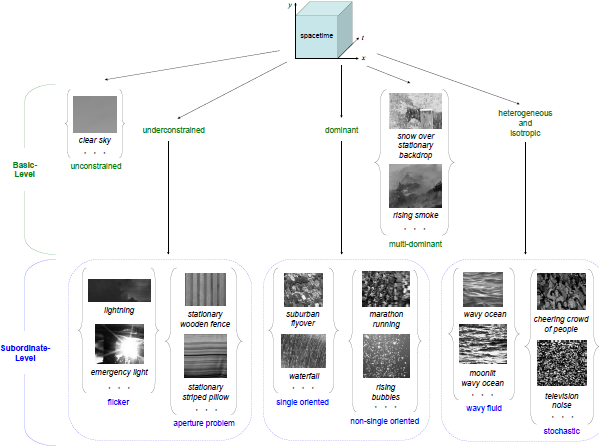 Furthermore, each of these categories have been central to research regarding the representation of image-related dynamics, typically considered on a case-by-case basis. To evaluate the ability to make finer categorical distinctions, several of the basic-level categories were further partitioned into subordinate-levels. This partition is based on the particular spacetime orientations present in a given pattern. Beyond the basic-level categorization of an unconstrained oriented pattern (i.e., unstructured), no further subdivision based on pattern dynamics is possible. Underconstrained cases arise naturally as the aperture problem and pure temporal variation (i.e., flicker). Dominant oriented patterns can be distinguished by whether there is a single orientation that describes a pattern (e.g., motion) or a narrow range of spacetime orientations distributed about a given orientation. Note that further distinctions might be made based, for example, on the velocity of motion (e.g., stationary vs. rightward motion vs. leftward motion). In the case of multi-dominant oriented patterns, the initial choice of restricting patterns to two components to populate the database precludes further meaningful parsing. The heterogeneous and isotropic basic category was partitioned into wavy fluid and those more generally stochastic in nature. Further parsing within the heterogeneous and isotropic basic-level category is possible; however, since this more granular partition is considered in the UCLA data set , in the YUVL data set only a two-way subdivision of the heterogeneous and isotropic basic-level category is considered. K.G. Derpanis and R.P. Wildes, Dynamic Texture Recognition based on Distributions of Spacetime Oriented Structure, In Proceedings of the IEEE Conference Computer Vision and Pattern Recognition (CVPR), 2010. K.G. Derpanis and R.P. Wildes, Spacetime Texture Representation and Recognition Based on a Spatiotemporal Orientation Analysis, IEEE Transactions on Pattern Analysis and Machine Intelligence (PAMI), to appear. E. Rosch and C. Mervis, Family resemblances: Studies in the internal structure of categories. Cognitive Psychology, vol. 7, pp. 573-605, 1975. P. Saisan, G. Doretto, Y. Wu, and S. Soatto, Dynamic texture recognition, in CVPR, 2001, pp. II:58-63.